Phoneword is a small software application designed specifically for helping you determine the phone number for a given string of characters. An intuitive and comprehensive application designed to provide you with a simple method for determining the phone number for a given string. Phoneword is a simple, yet handy application that you can use to find out the phone number that corresponds to a string. 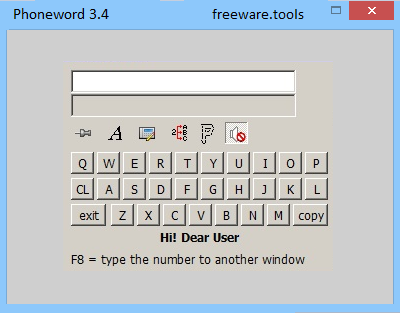 Phoneword displays a QWERTY keyboard and a phone keyboard within its main window, enabling you to enter the string you want to process. In othr words, it's a simple tool that helps you identify phone numbers from user-defined character strings. You are welcomed by a clean feature lineup that empowers you to tweak the dedicated parameters with just a few clicks. Everything is kept as basic as possible, so there’s support for only a few configuration settings that you can play with. Phoneword embeds a built-in QWERTY keyboard and a phone keyboard within its main window, enabling you to enter the string you want to process with minimal effort. The results are displayed in real-time, which means you get to see the numbers as soon as you start typing the letters. What’s more, you are allowed to copy the results to the clipboard, so you can easily paste data into other third-party programs. Additionally, you can make use of the preset hotkey for quickly copying the information to the clipboard. Since the tool doesn’t come packed with any configuration settings, even less experienced users can make the most out of it in no time. As it would be expected from such a small utility, it remains light on system resources, so it doesn’t hamper computer performance, nor interfere with other programs’ functionality. To sum things up, Phoneword combines ease of use with several handy features in order to help you identify phone numbers from user-defined character strings.